All is calm at the intersection of Ingersoll and Jenifer Streets Thursday December 20, 2012 after the snow had completed its 24 hour assault on the Madison area. 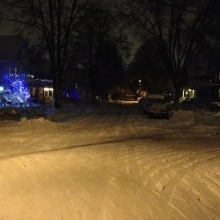 Images of the Wil-Mar and SASY neighborhoods during and after Snowmageddon 2012, December 19-21, 2012. This entry was posted in Madison, Madison Arts & Entertainment, Willy Street, Willy Street Arts & Entertainment and tagged Friends of Starkweather Creek, Madison Winter Solstice 2012, Olbrich Park, Olbrich Sledding Hill, SASYNA by CusterCutie. Bookmark the permalink. Nice pictures, thanks for sharing them. But for my nickel, whatever aesthetic pleasure could be gained from watching the photo frame resize itself and the photos slowly appear was outweighed by the extra time I had t o wait to see the pictures. Not that my time is particularly valuable, but nevertheless I would have preferred to see the pictures as soon as I clicked on the thumbnail. Thanks for the comments…we may be adjusting the pictures size in the future for a wider arrange of users.